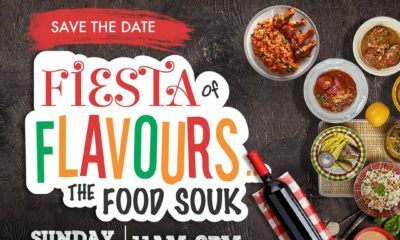 Eventful’s Fiesta of Flavours is a world class food and beverage exhibition and the first of its scale and caliber in West Africa. It will be three days of the best in local and international cuisine, cutting edge food technology and cooking techniques as well as a display of the best wines and whiskeys the world has to offer. In addition to being a fun activity for food lovers and families to participate in during the Christmas months, the Fiesta is also creating avenues to educate professionals and workers who are part of the food industry. 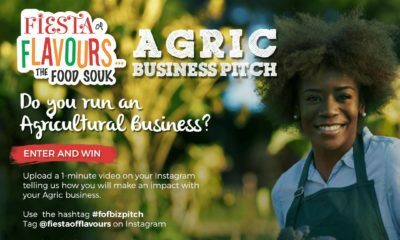 The Best Of The Food Industry: The fair will have over 100 stalls and several food trucks occupied by the most innovative and delicious foods and beverages that Nigeria has to offer. Our vendors will be handing out free samples as well as selling their wares from 10am to 10pm daily. Street Foods of Lagos: Just as important as our new innovative food industry are the traditional delicacies. The Fiesta team has found all the most sought after Bukas, and for three days you will not have to travel to the depths of Marina or Surulere to eat your favourite peppery rice or Amala. Kids Section: This area will consist of several activities to entertain kids including cooking classes, bouncy castles and dancercise among other things. Foods of Africa Display: Here you can taste delicacies from over a dozen African countries. 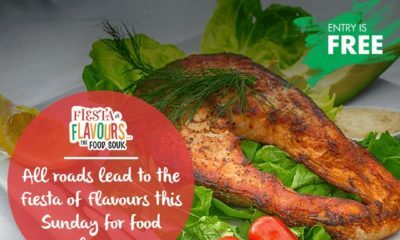 It promises to be a culinary journey of bold African aromas and spices. Food Demonstrations: International and local celebrity chefs will conduct cooking classes on their world-class kitchen stage to teach several recipes and skills to fair goers. App and Tech Tents: Here they bring together all web savvy foodies! Their millennial fair goers will find Food delivery apps, food bloggers, photographers and so much more in this section. There really is something for everyone. Even the more artistic foodies will be accommodated in this area. Music stage: At the focal point of the event will be an amazing music stage where celebrity Djs and a live band will entertain fair goers. Visitors are welcome to bring their picnic mats and chairs and spend all day taking in the amazing ambience that the music and aromas creates. Banquet/Seminar Area: A separate space will be created to accommodate guests for seminars and tastings during the day. Fine Dining Restaurant: Every evening, this area will be converted into a restaurant of tables that must be booked and paid for beforehand. Lounge: The lounge will serve as a relaxation space for fair visitors to taste the best of liquor and wines and have conversations in a more controlled environment. Activities and Games: There will be an array of other activities that can be performed by fair goers to keep them entertained amidst all the food and drink being consumed. Food competitions will be conducted ever so often and the winners will win wonderful prizes courtesy of our sponsors! 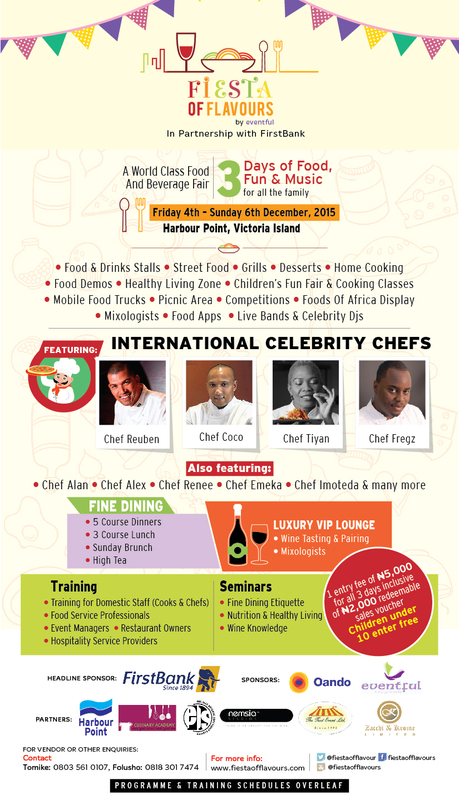 ‘Fiesta of Flavours’ is proudly sponsored by: First Bank, Oando, Eventful, and Peak Milk. Tickets: N5,000 for a 3 day pass. N2,000 of this will be issued in tokens to be spent at the fair. Kids under 10 enter free! Crazy Offers of Up to 60% Discounts & 5% Cash back at SPAR’s Black Friday Sales!